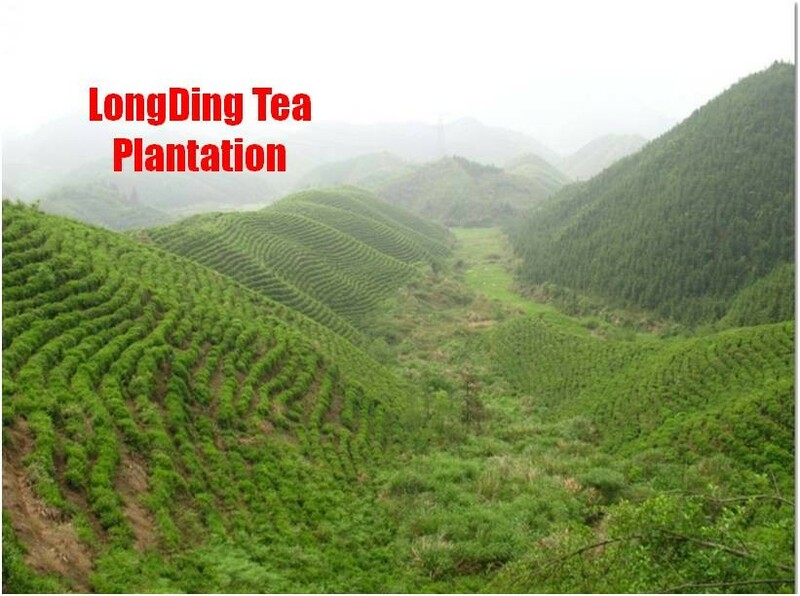 Long Ding Tea is produced in Kaihua County,Zhejiang province which is the source of Qianjiang river. 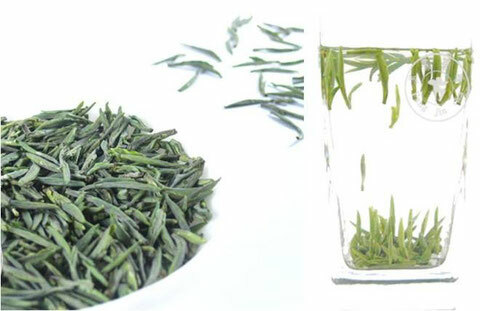 Located at the juncture of Zhejiang, Anhui and Jiangxi Provinces,Kaihua county along with Wuyuan county,Jiangxi province and Xiuling county,Anhui province are named as 'Gold Triangle of Green Tea' by many tea experts. Longding lake is on the top of the Giant Dragon Mountain. 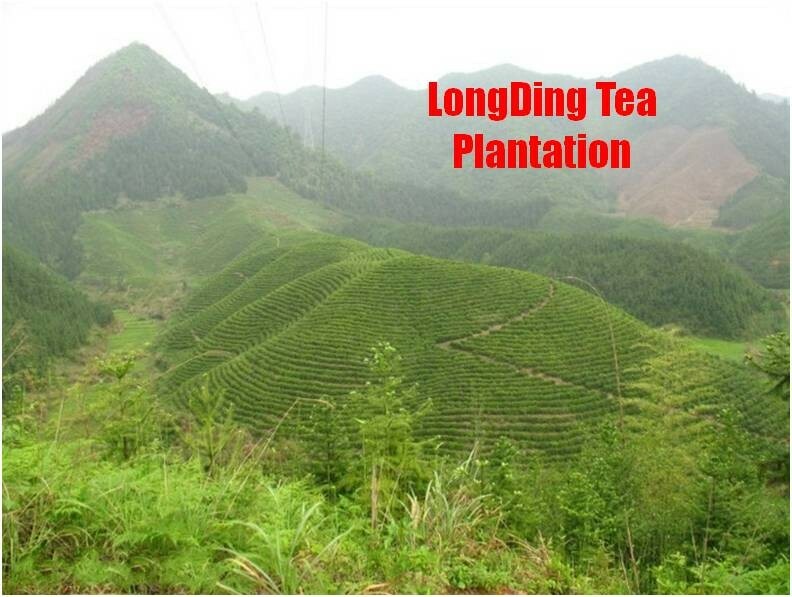 The soil here is loose, soft and rich, with plenty of water and proper temperature,creating the basic conditions for Long Ding tea's superb quality. 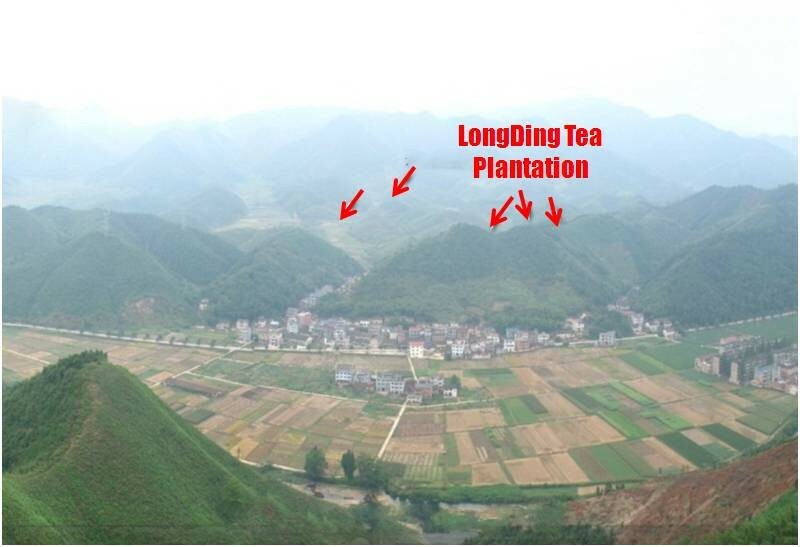 "Long" is the word "dragon", and "ding" means "the top", referring both to the geographic nature of the production area (that the river zig-zag like a dragon in Chinese painting; rivers are often referred to as dragons) the tea comes from, and the quality. 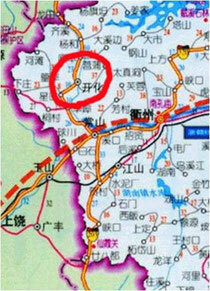 It is said that the tea was developed in the 1950’s when a Jiu’keng Zhong cultivar was introduced to the region. It must have been the subsequent political and social catastrophes that arrested the whole of China for over a quarter of the century that made it virtually unheard of until the 1980’s, like perhaps a lot of other things. Since the 1980‘s, there maybe a few new or “reconstructed” historical fine green teas come about every year in China but only a very small number are worth gastronomic attention so far. Kaihua Longding is one. The tea is bright and lively with a unique sharpness accented with bouquet and a slight touch of herb. The body is deep and long for a baked green tea. Its character differentiates it well from other varieties in this region and adds an unmistakeable breadth in the taste spectrum of Chinese green teas. 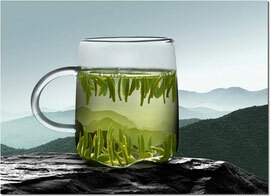 The leaves are so tiny yet beautiful that some people who drink this tea would rather sacrifice full taste to infuse it in a tall glass for looking at the “dance of small orchids” as the leaves float and sink in the hot water. They may not be the smallest leaf in Chinese green tea, but the integrity of the “one shoot, one leaf” plucking practice is so adorably reflected in the perfect tiny “orchid” shapes that it really tells a lot of the attentive labour that is employed to produce the tea. 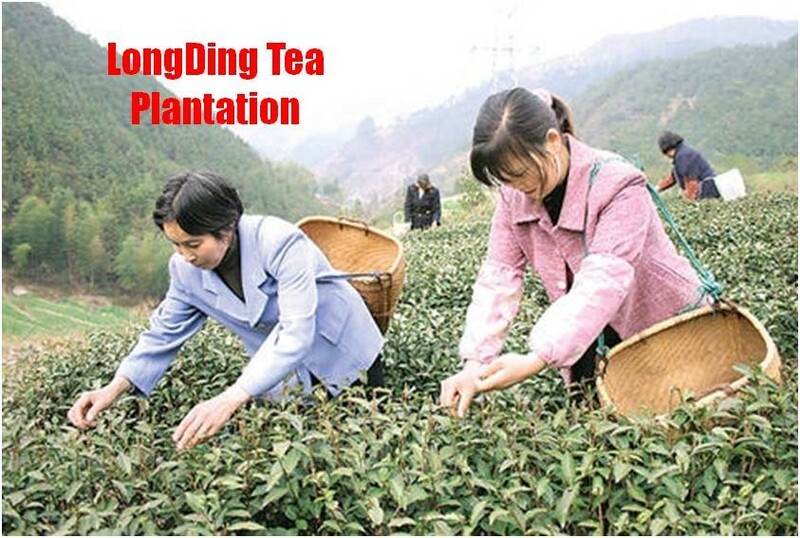 Long Ding Tea is made from the new leaves of good quality strong tea plants in the unique traditional way. The finished Long Ding Tea looks straight and elegant in appearance. It has an appealing flowery taste with a long sweet aftertaste. 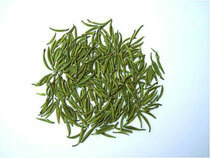 The dried tea leaves are thick and about 5mm - 6mm in length. When brewed, the tea leaves stand straight up in the water (an indication of exceptional quality). 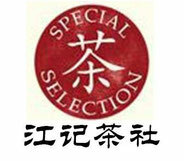 It is an excellent green tea with nice outlooking and good qualily. 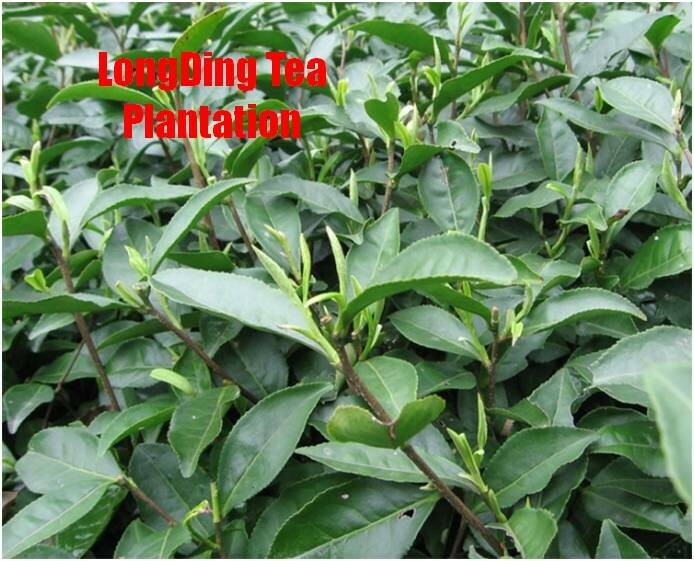 Kaihua Longding has beautiful green and thick bodied tea leaves. Always picked before Qingming (Pure Brightness);The finest grades are produced in late March and the other reasonable ones in Mid April. The aroma of this tea is minty fresh combined with a wonderful peach-like fruity taste and a lingering sweet aftertaste. 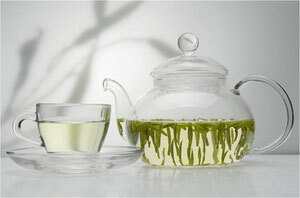 Brewing vessel: gaiwan, glass mug;A fine high density Yixing pot is ideal to bring out the full taste profile of a crisp green tea such as Kaihua Longding and maintaining a balance. Normally the easiest way to take care of the issue is the use of a good Yixing pot. Storage: Keep it cool and dry with no exposure to direct sunlight and other spices.